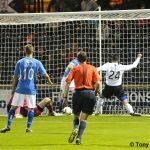 Raith Rovers lost out to Queen of the South by the odd goal in seven, in a quite incredible game at Stark’s Park last night. Raith began with the same starting XI which did so well to take a point from Easter Road last week, which meant Christian Nade playing a lone role up front, with Martin Scott tasked with supporting him from a deeper position. 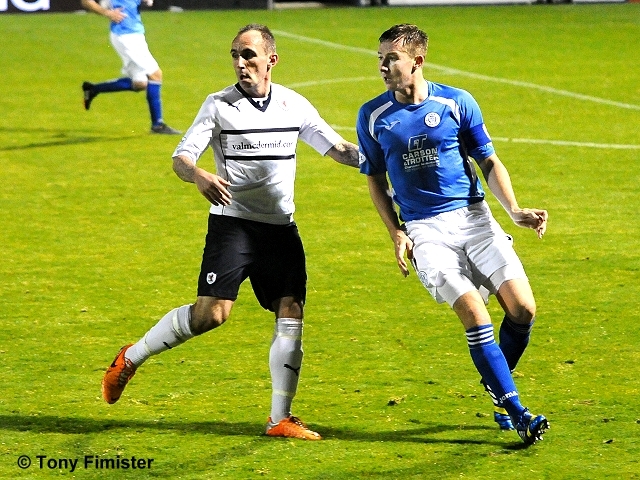 For Queens, ex-Raith forward John Baird started up front. 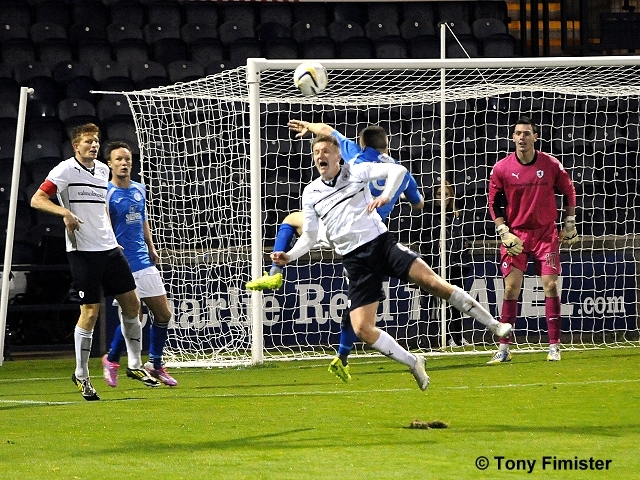 Despite the impressive result last week, it was a nervy start from the home side. 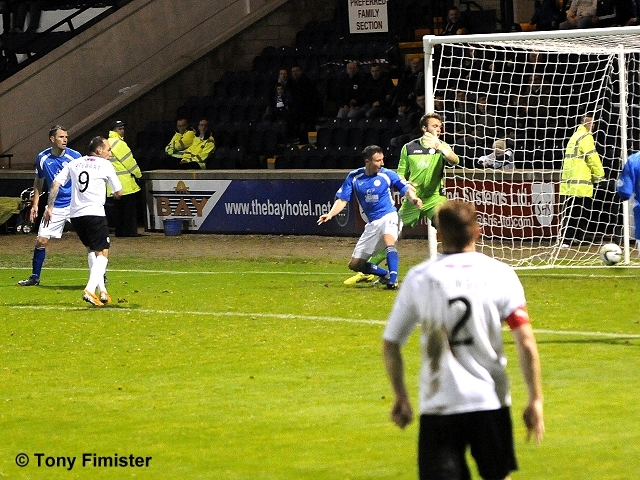 After just 20 seconds, Iain Russell picked up the ball on the right hand side, and curled an effort towards goal that Laurie Ellis headed away, although Ross Laidlaw may have had it covered. 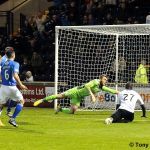 Baird was then unlucky to see his first time effort smack off the bar, with Ross Laidlaw stranded, as Rovers struggled to make any kind of headway. 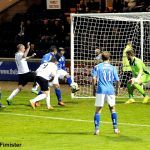 James Fowler’s players seemed a yard quicker in the early stages, and it was no great surprise that they took the lead in the seventh minute. The identity of the first goalscorer was also unsurprising. A cross from the right-hand side from right-back, Lewis Kidd, squirmed away from Ross Laidlaw’s grasp, and John Baird appeared to get the final touch, swinging his foot at it, despite lying on the ground. 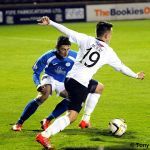 The bright opening from the Dumfries side was exacerbated further by Raith squandering possession away in the middle of the park. 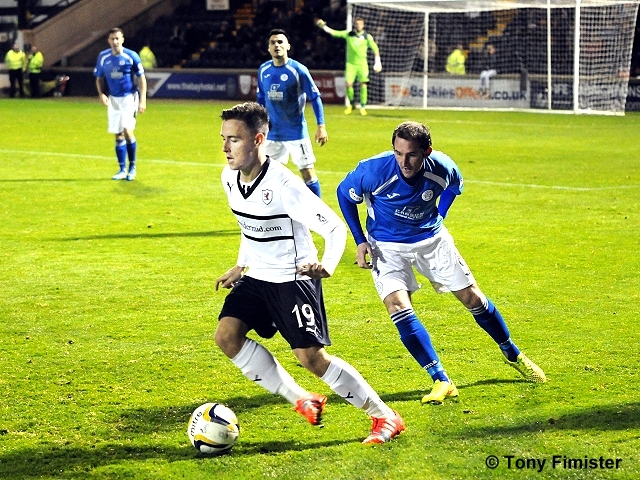 Twice in quick succession, play broke down in the centre of the Raith half, which firstly led to Gavin Reilly’s shot being blocked, while the second saw Baird’s attempt easily gathered by Laidlaw. While Rovers had looked sloppy up to that point, only a good stop from Clark prevented them from moving level after 20 minutes, in a move that was started, and almost finished by Martin Scott. 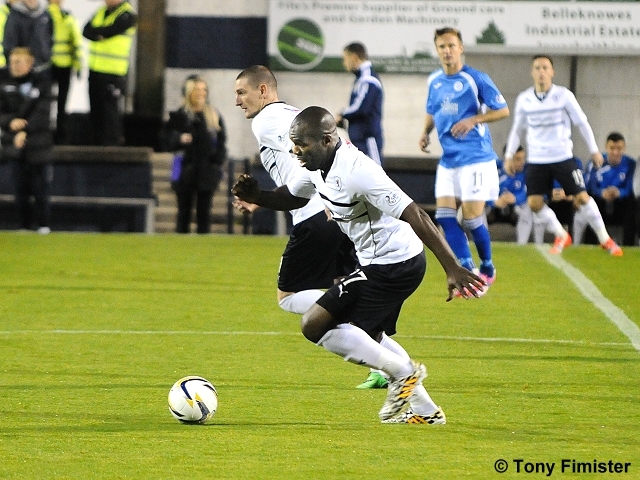 The midfielder played it to Thomson, who progressed well down the right flank. 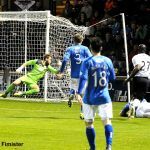 He passed it to Conroy, whose cross to the back post was well met by Scott, but his header was palmed out from just under the bar. 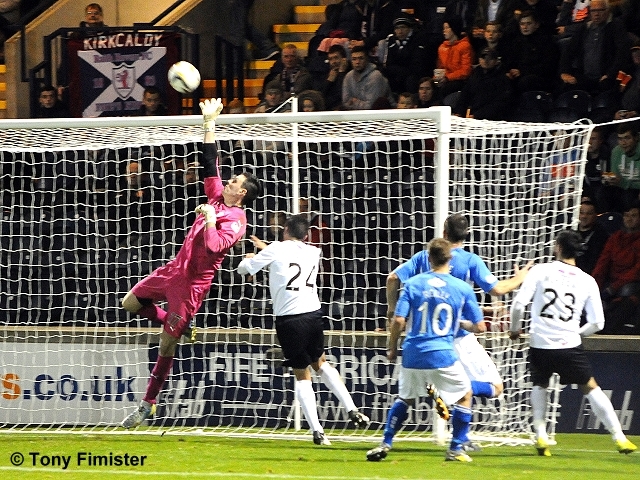 That was a fleeting attack from a Raith point of view, and they were lucky not to be two down after 25 minutes. 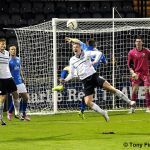 A long ball forward somehow saw Gavin Reilly in on goal, and while his first shot was blocked by Paul Watson, his second attempt looked to be in, but had in fact went just wide, rippling the side netting in the process. 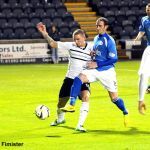 A moment later, a low cross evaded Laidlaw, and he must have been relieved to see Laurie Ellis clear from under the bar. 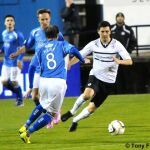 The frustrating thing from a Raith perspective was that while Raith they struggling defensively, Queens didn’t look entirely sturdy in that area either. Indeed, they had to rely on Clark again, when McKay teed up Scott, and his shot was beaten away. 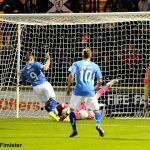 The Doonhamers squandered a great chance on the half-hour mark when a Carmichael cross found Reilly in a yard of space, but from six-yards out, he got underneath his header, and nodded it over the bar. The game then started to settle down, but still the play flowed in one direction, and Laidlaw had to use every inch of his frame to tip over a Carmichael lob from the edge of the box. 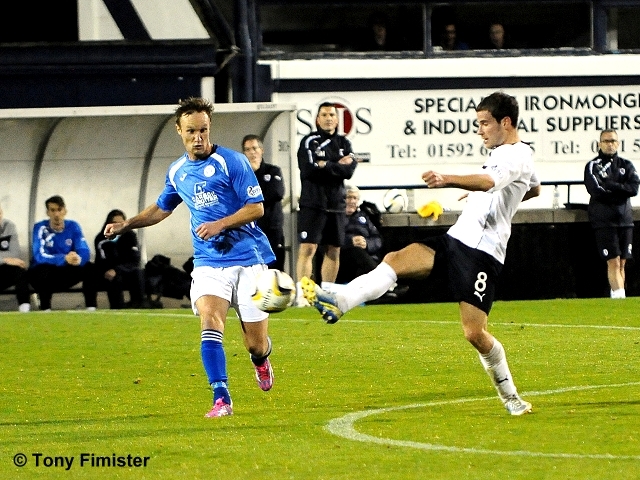 Raith had been second best in the first half, and in particular, were being bossed in the middle of the park from Mark Kerr, who despite just coming back from injury, was dictating the game from midfield. The half-time whistle must have been a blessed sound for Grant Murray, who was able to get his players down the tunnel just one behind, and still in the match. 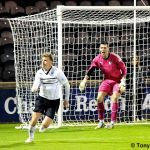 Unfortunately for Raith, the second period started in much the same fashion, and they were lucky not to go further behind, when a Carmichael header struck the inside of the post and was cleared desperately by Thomson. 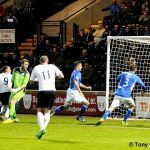 The 4-4-1-1 formation that had served Raith particularly well just six days previously, was proving far less succesful this time around. Nade was struggling to hold the ball up, and apart from Martin Scott, few players were coming up in support, while little service was coming from the wide players, McKay, or Conroy. As such, it wasn’t a huge surprise when Queens went two in front. 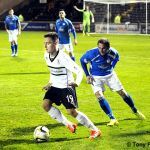 The move started in the centre of the park, when Barrie McKay attempted to flick the ball on, but instead gave possession away. Compounding matters by not tracking back, he left Thomson to be doubled up, and he could do nothing to prevent a cross being teed up to Carmichael at the back post, who rolled it to Gavin Reilly, who couldn’t miss from six-yards. 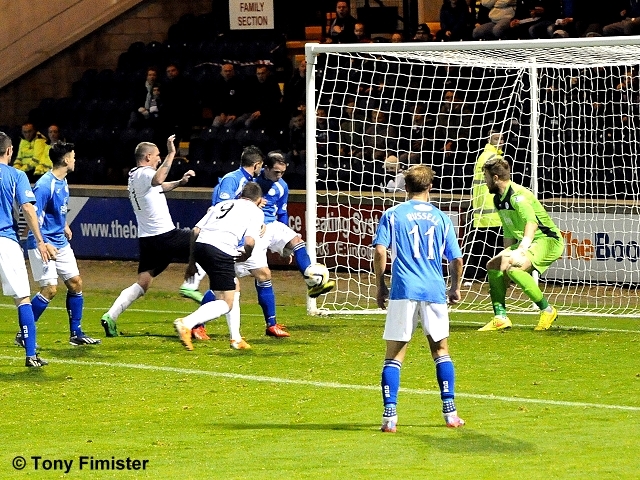 Grant Murray had decided enough was enough, and changed his personnel, and system, after 57 minutes. 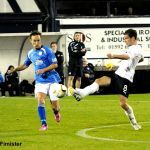 Barry McKay made way for Grant Anderson, and Mark Stewart replaced Kevin Moon, with the ex-Falkirk forward providing a foil with Nade up front. 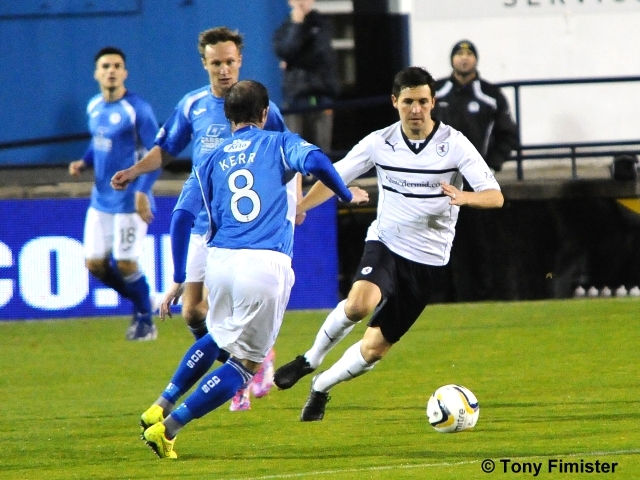 What followed, was one of the most remarkable final half-hour’s to take place at Stark’s Park in some years. The change made instant dividends. 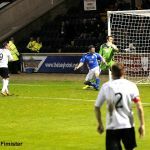 A long throw from McKeown caused a huge amount of panic in the Queens penalty area, and from a Scott header on, Stewart flicked the ball past Clark with virtually his first touch. If the crowd weren’t entirely certain if the momentum had swung Raith’s way, then the equaliser in the 62nd minute was an absolute confirmation. Stewart and Nade were again causing a nuisance of themselves, but when the ball fell to Conroy, he couldn’t quite get his shot off properly from the edge of the area. Clark didn’t do particularly well however, palming the ball out to the onrushing Nade, who diverted it past him, without seeming to know too much about it. 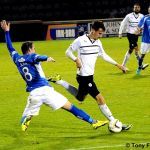 Suddenly, Raith had pace in abundance, with Stewart and Anderson’s willingness to run directly at the defence, putting Queens on the back foot for the first time. 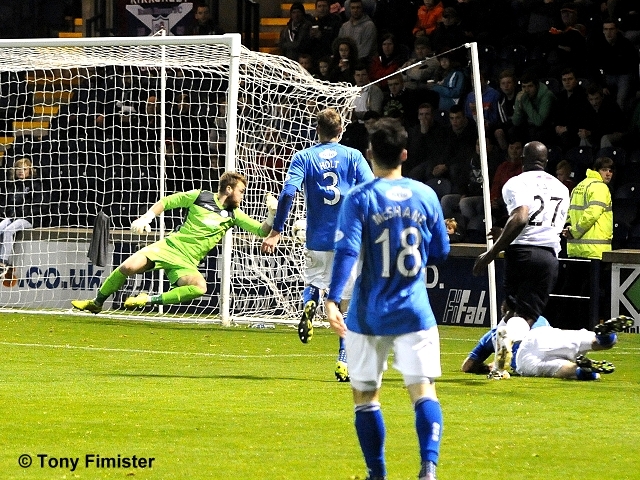 With 20 minutes remaining, Raith almost sneaked ahead, when another McKeown throw was met by Nade, but his header was well tipped over by Clark. 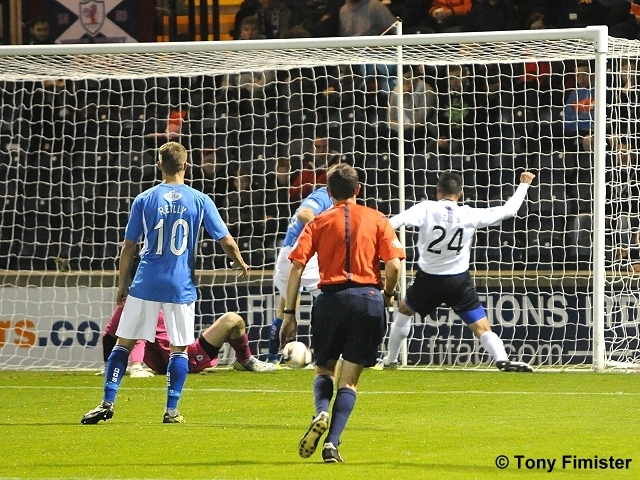 From Conroy’s corner, Nade again met the ball, but his glancing header went just wide. 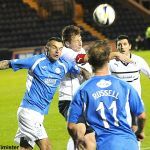 Then, with Raith in the ascendency, they were given a further boost, when Queen of the South were reduced to ten men. 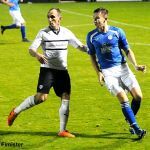 Jason Thomson was stopped in his tracks as he made his way down the right-hand-side by Kevin Holt’s sliding challenge, which the referee deemed to be a red-card offence. However, rather than sit back, Queens went 3-2 ahead, with a goal that could again be viewed poorly from a defensive perspective. Russell was able to swing the ball in, and Derek Lyle, who had only just been introduced, drifted in-between two defenders to plant a header beyond Laidlaw. 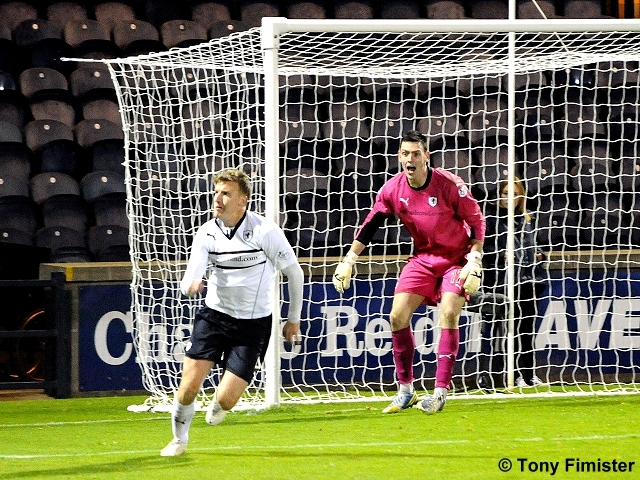 Raith hit back immediately though, in a game that was starting to resemble something out of a school playground, and was all the better for it. A cross from Anderson was misjudged at the back post, allowing Scott to get to the bye-line, who picked out Stewart, who side-footed home from close range. 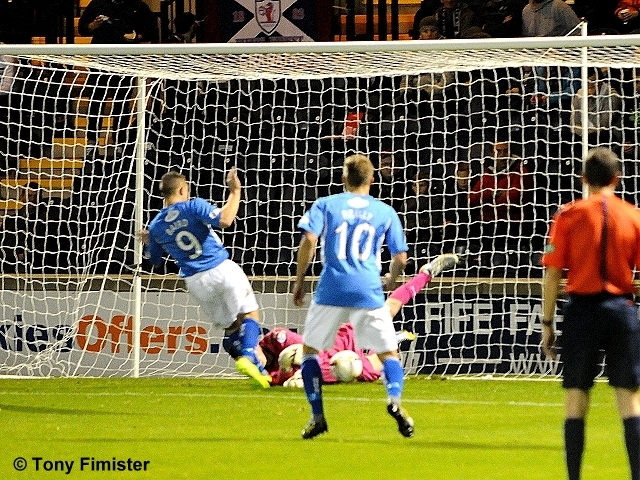 At this point, you’d have got long odds on a Queens win, as Rovers looked to tighten the screw against the ten men. Their was an awkward looking injury to Christian Nade however, who was stretchered off for treatment. If he didn’t feel bad enough, he was then struck by a Grant Anderson drive while being attended to by the medical staff. 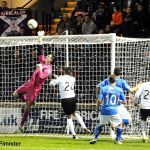 As the fourth official signalled for five additional minutes to be played, the away side had a close escape, when Scott made space in the box, but couldn’t get his shot away. Ellis then should have scored the winner, but a combination of Clark, and Russell, somehow kept his close range effort out. In the 93rd minute, Thomson then had the chance to win the match, but as he reached the edge of the box, and with options available, he chose to go it alone, but mishit his shot straight at Clark. 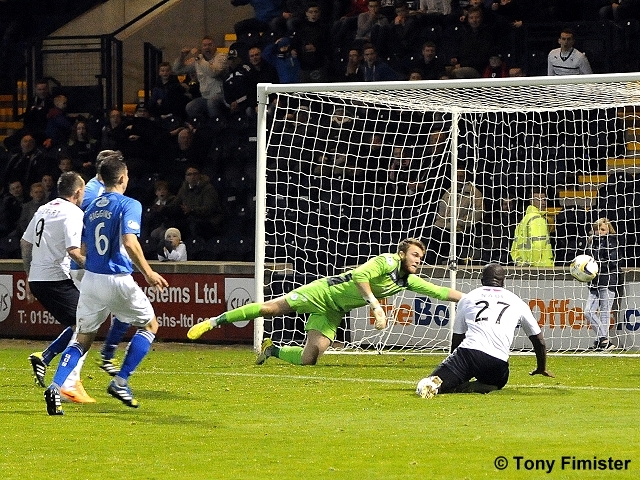 Raith would pay for their profligacy, with a winning goal for Queens in the final of those five extra minutes. Derek Lyle was given too much time to turn and lay the ball off to Iain Russell, and his shot from outside the box, took a deflection off Ellis, and swerved past Laidlaw. It was almost the last touch in an exhilarating match, that Raith could easily of lost before half-time, and yet will look back and wonder how they didn’t win it, after passing over some great opportunities in the final few minutes. While the attacking play was encouraging in that period, to lose two goals to ten men was arguably the most disappointing fact of the match. 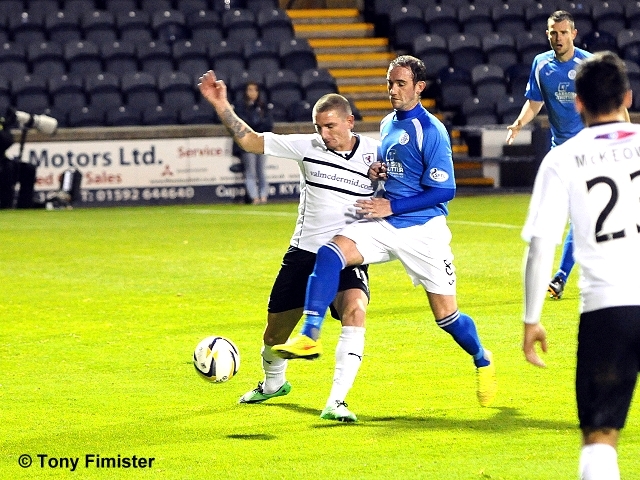 Raith’s next match is away to Rangers at Ibrox, on the 18th of October. Ref blows for a foul then allows play to go on. Boos ring out in the south stand. +2 half time. Rovers lucky to be only one behind. 2-1: Stewart's first act is to win a throw on the left. 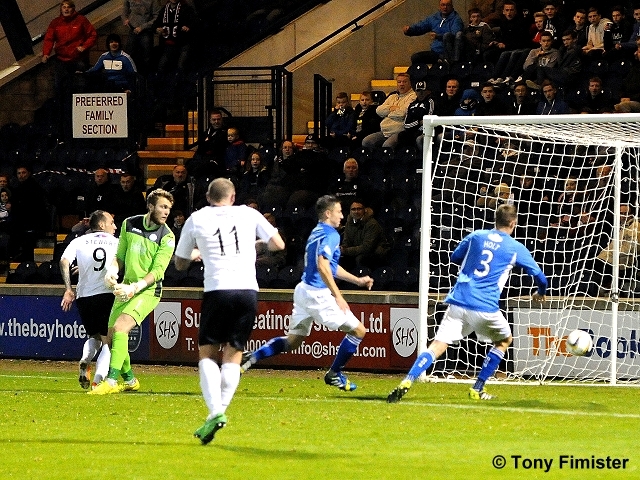 McJeown's long effort ands with a Stewart goal. 2-3 Lyle heads over Laidlaw to put the 10 men in front again. Full time. Queens take all 3 points right at the death.